Sk2: SK2 - Weekly Updates! We have finished another exciting week Alhamdulillah. Students are getting into their classroom routines. They start the day by playing with the play dough which improves their hand strength, hand-eye co-ordination, imagination and motor skills. In Language Art, we reviewed alphabets up to letter K. Also, we read a special book "David Goes to School" and talked about behaviour at school. This book will help them learn the classroom rules insha-Allah. 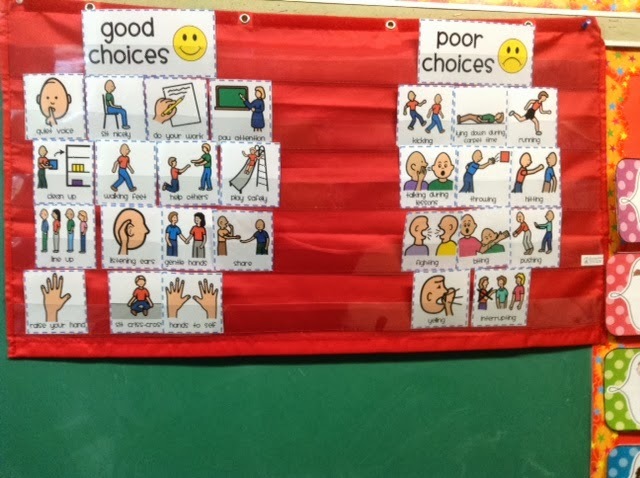 We also created a pocket chart to compare and contrast of "Good choices" and "Bad choices" for our classroom rules. Students sorted different picture cards to compare and contrast the two choices. They all totally got the idea, and throughout the week, it was helpful to refer back to this chart. In Number Sense and Numerations, we reviewed the number "3" by tracing, printing and colouring in the worksheet. Alhamdo-lillah, we finished all the presentations of "It's All About Me, Tee." Students did a great job presenting their Tee's and It was a great learning experience for the whole class.